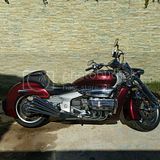 2004 Honda Rune Valkyrie NRX1800 cruiser Maroon Honda's Concept Motorcycle from Tokyo Motorcycle show. Honda's Goal was to create ROLLING ART. Which they have here, only made one year. Same bike Tom Cruise owns and claims as his favorite. Clean Title, one owner, runs great. Free Delivery at asking price anywhere in Northern United States. 2013 Ducati Monster 800 Mainly just frame,they are cheap used, or just weld up. 2003 Honda VTX1800C Minor damage,Runs and drives,We can paint to order if needed, call for details. .